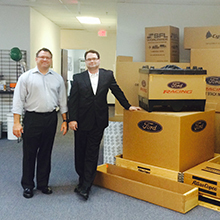 Owner Joe Gaikoski started Amerisource with 4 credit cards and a passion for the future of packaging. While serving as Director of Distribution for a national home furnishings retailer, Joe recognized two un-met needs in the packaging industry: (1) the abundant need for daily “just in time” delivery and (2) the opportunity to leverage technology to facilitate packaging procurementand supply chain management. He resigned his Director position in 1997 and started selling boxes to a handful of customers in DFW. Joe, like many business owners, experienced the negative impact of the financial meltdown to his newly established business and soon realized he needed a new approach to get back on track. He went door to door seeking commercial customers and hired a good friend experienced in sales to help him. Business grew steadily. For example, in 2012 Amerisource grew its staff 100% by adding six full-time equivalent employees. Joe still had a desire to see growth and wanted to go to next level to double and triple sales. That’s when the Garland Chamber introduced him to Judith Collins of the Dallas SBDC. Judith’s guidance and direction benefited the organization in a multitude of ways. For example, she opened their eyes to government contracting opportunities when she toured the facility early in 2013 and witnessed the company’s capacity to handle large orders. As a result to Amerisource grew 125% and Joe plans to hire another 15 full timers. Amerisource estimated 2013 revenues to reach $15 million by year-end.